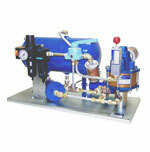 The 30 series power units are an entry level system utilizing a 10-4, 10-5 or 10-6 pump mounted on a base plate with an filter regulator lubricator (FRL) assembly, muffler, high pressure manifold, manual release valve and fluid pressure gauge (optional on units 30,000 psig and higher). With a small footprint (12" x 12") this unit is ideally suited for applications with limited space. User need only supply an air line, fluid inlet and fluid outlet lines for system to operate. The 40 series power units utilize the same basic components as the 30 series and mount them on a larger baseplate (largest is 28" x 12 1/2") which can accommodate an optional reservoir - 2, 3 or 5 gallons. Best suited for applications not requiring large amounts of fluid, pressure testing, clamping and holding etc. Units need only an air supply line and fluid pressure line for system to operate. 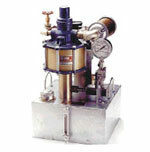 The 50 series power units are self contained high low systems. Using either a 10-5 or 10-6 series pump and a 3 gallon pressurized reservoir the unit will provide low pressure high flow oil for rapid initial actuation (cylinder extension). The unit senses increased back pressure and automatically starts the pump that will bring fluid pressure to required level. 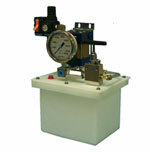 The pump will stall and hold at selected pressure until operation is completed. The 50 series units were designed to save operating and maintenance costs which combined with the SC pumps ability to hold pressure and not require any energy, all add up to an economical and environmentally friendly solution for hydraulic power. The 60 series power units incorporate either the 10-5 or 10-6 series pump an FRL assembly, high pressure plumbing, manual release valve and fluid pressure gauge (30,000 psig and higher optional) all mounted on top of a 5 or 10 gallon stainless Steel reservoir. These units combine all of the features on our 40 series with only a 14" x 14" footprint allowing a lot of hydraulic power in a space conserving package. The 90 Series Portable Test cart is perfect for hydrostatic or burst testing, water-jet blasting, hydraulic press operation, hydraulic cylinder and valve actuation, or any applications where mobility is needed. This series offers many popular features found on our other standard power units such as air drive controls and pressure gauges. It is compatible with most fluids and can be ordered with either 5 or 10 gallon stainless steel reservoirs. 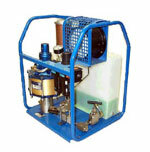 Pressures up to 65,000 psi can be achieved by using any of our 10-series pumps and a 100 psi air supply. The L3 series power units incorporate a L3 series pump, air pressure regulator, air shut-off valve, high-pressure gauge and a return valve. Standard power units are available in three main models offering installation of all hydraulic components on a base plate, polyethylene reservoir (1 or 2.2 gallon) or tubular frame. These units are economical and compact. Standard overall dimensions vary from 9��x10.5��x9�� to 18��x19��x15�� weighing from 15 to 25 pounds depending on the model. 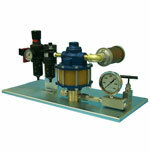 We can also design custom power units that better adapt to your application requirements. Please contact SC Hydraulic or your local distributor for more information and further assistance on your application. SC Hydraulic Engineering�s tubular power units incorporate the 10 and D Series pumps, 2.2 gallon reservoir, air supply filter/regulator and shut off valve, high pressure plumbing and panel mounted fluid pressure gauge into a rugged portable tubular frame. (Gauge is optional on units rated above 30,000 psig). You get the same features of the 40 series unit built into a protective frame facilitating easy portability without the concern of component damage. These units are excellent for bolt tensioning, torque wrenches, or industrial applications requiring portability. The units let you bring high pressure hydraulic power to the job. 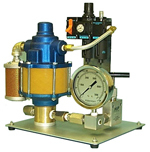 Simple to use; just connect the existing air supply to the unit and up to 65,000 psig hydraulic pressure is at your disposal. SC Hydraulic Engineering is a leading manufacturer and designer of an ever growing line of high pressure, air-driven liquid pumps, as well as air and gas boosters.